Laura Schoenfeld and I have been working on this challenge for months, and I’m so excited to share it with you today. If you’ve listened to our podcast (The Ancestral RDs), you know that getting enough calories is absolutely crucial to good health. In fact, both Laura and I have changed many of our client’s lives simply by increasing their calories. Symptoms like fatigue, blood sugar crashes, anxiety, and more disappear practically overnight when you start eating enough. We’ve seen it happen firsthand. In an effort to bring calorically-appropriate diets to the masses, we knew we had to create something that made it incredibly easy to eat enough. Many of you don’t want to be counting calories, weighing your food, etc. We get it; it’s not that much fun! 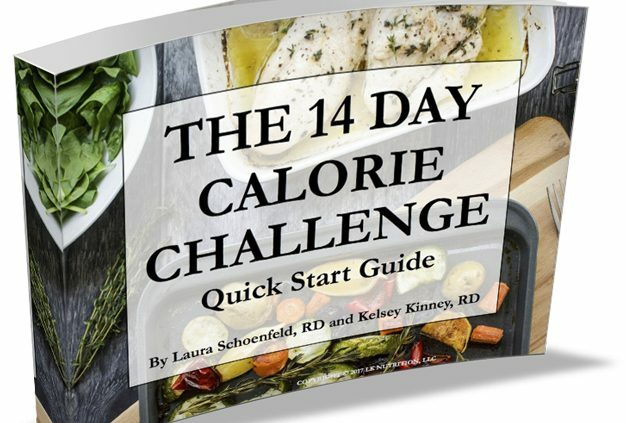 So we created the 14-Day Calorie Challenge to help you. The challenge? To eat a balanced calorie and macronutrient-containing diet for two weeks to see how much your energy can improve. We’ve created five two-week meal plans designed for people who want to follow a gluten-free, real food diet that fits their unique needs. The best part about these five meal plans is that we’ve designed them to meet a variety of different needs. So if you have a gut infection or an autoimmune disease, we’ve created a plan just for you. We’ve also provided guidance on how to easily tweak the meal plans if you need a higher amount of calories than the range we’ve provided (between 1800-2200 per day). The cool part is you get all five of these meal plans as part of your purchase. That way, if you need to change which meal plan you’re using, you can get more or less strict on your food choices depending on your needs. For example, maybe a strict Paleo diet causes terrible bloating for you. Perhaps you’d do better on the Digestive Health plan. 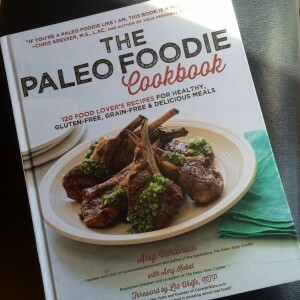 Or maybe you’re tired of following the Autoimmune Paleo (AIP) diet and want to branch out to a “normal” Paleo diet for a while. Or perhaps you’re unnecessarily avoiding all grains and dairy, and feel the Real Food plan is the most attractive to you. Whatever meal plan fits best for you is available for you to test as part of the challenge. This is a brand new product and right now we’re offering over 75% off the eventual price — that means you can get the meal plans for just $7 until Thursday, January 18th at 11:59 p.m. ET. Starting right now until midnight (EST) on Thursday, January 18th, we’re offering the 14-Day Calorie Challenge for just $7. Just $7 for over 70 days of real food recipes. $7 for 10 weeks of shopping lists and meal plan calendars. If you’re ready to take the 14 Day Calorie Challenge, CLICK HERE to get your copy of the program for 75% off. And if you’re on Instagram or Twitter, use the hashtag #14DayCalorieChallenge to show us what you’re eating. It’s time to fuel up! This is a guest post by my intern Lisa Hansen, an RD-to-be! Note: this recipe uses my lemon-ginger soda from the Eat The Good Bugs eBook that you can get for free by subscribing to my newsletter. Who would have thought that “nourishing” and “gummy bears” could be paired in the same sentence? Definitely not me, but I’m here to change that. 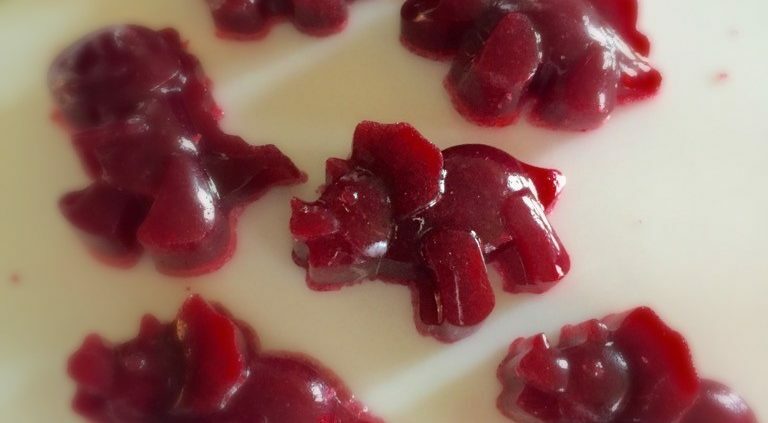 To throw a twist on the traditional gummy bear, add some good gut bacteria, grass-fed gelatin and you get a guiltless mid-day pick me up when you’re craving those sugar bomb gummy worms from the store. 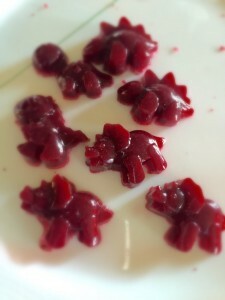 You could almost say these gummies have super powers, especially when made in dinosaur molds. If you’ve been around the Healthy Gut Healthy Life website then you know how beneficial bacteria can be essential in maintaining your good gut health. Most of these foods revolve around fermented foods with a saltier flavor, so this recipe adds a little sweetness to the mix. If you’re not sold on these quite yet, all you need is 6 ingredients and 15 minutes once you’ve made the lemon ginger soda. Blend cherries and lemon juice on high until smooth. Pour into a saucepan. Add honey and gelatin and whisk together until it forms a thick paste. Heat on low for 5-10 minutes while continuing to whisk. Once thin, remove from heat. Let cool slightly before moving on to the next step. Add ginger soda, pour into molds or a glass baking pan and place in refrigerator for at least 1 hour. If in molds, simply pop out, if in a baking dish, cut into slices and enjoy! Make sure to add the ginger soda when the mixture is removed from the heat in order to keep most of the good bacteria alive, as they are sensitive to high temperatures! It’s getting awfully hot in New York these days, and if you’re like me and try not to blast your AC all day long, you know you need to be drinking more water than usual. I’m one of those people who tends to forget to drink – I can literally make it to the end of the workday having barely had anything to drink. Not good! While there’s some debate over the “correct” amount of water to drink, I certainly don’t think it’s a good idea to be going that long without water. To trick myself into drinking more, I’ve been making this yummy concoction that I like to call the Cranberry Lemon Refresher. It’s super easy to make and it looks appealing and refreshing, so I’m more likely to drink it! 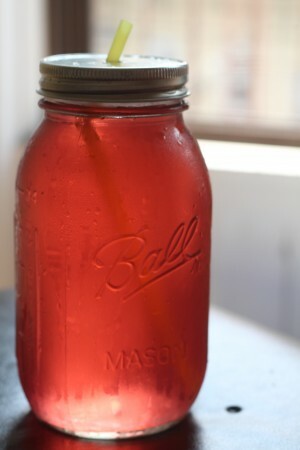 To make the Cranberry Lemon Refresher, all you need is water, a half a lemon, and 100% cranberry juice (not the cranberry juice “drink” that includes sugar or other juices). 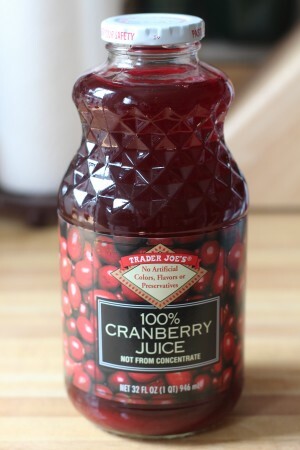 I like the cranberry juice from Trader Joe’s – it’s affordable and delicious! 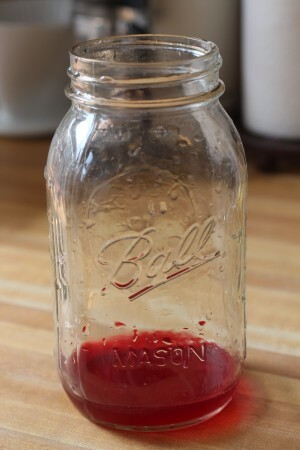 To begin, simply put a splash of the cranberry juice in your cup or jar (I love using a quart-sized mason jar for this!). Take a look at the picture below to see how much I put in a quart jar – it’s not a lot. Then add the juice of a half a lemon and fill it the rest of the way up with water. I love using a straw for this drink too, since I tend to drink more when I use a straw (they’re fun!). This is one of my favorite drinks of all time. Seriously. It’s spicy, warm, and soothing all at the same time. Perfect for a relaxing Sunday morning when all you want to do is sit around and read. Bring it out on the porch and enjoy the crisp fall air and let this chai warm you right up. 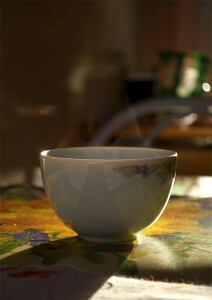 I love coconut milk in my chai because it adds another layer of flavor that’s missing with regular milk. Plus, it makes it a great option for those who are dairy free. Sweeten it up with a bit of raw honey and it’s to die for. When I make chai, I use a mortar and pestle to grind my spices but you can also put them in a plastic baggie and smash them with whatever hard object you happen to have in your kitchen. You want to start with whole spices vs. ground as the flavor is much better and you want to be able to take the spices out once you’ve boiled them in the water. Crush spices except cinnamon stick with mortar and pestle or in plastic baggie. Make sure you’ve cracked all the cardamon pods open. Add coconut milk and about 1/2 cup filtered water to small pot. If you don’t think this will be enough liquid to fill your mug, you can add a little extra water. Add crushed spices to the pot, along with the cinnamon stick. Continue to simmer on low for about 10 minutes. 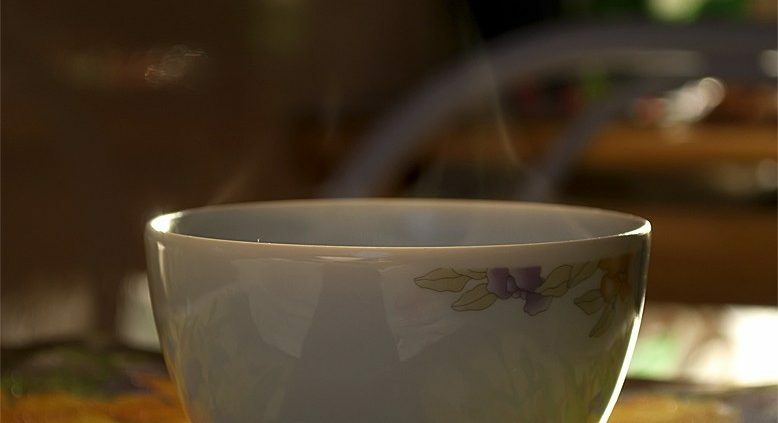 Turn off the heat and add tea bag or loose tea (what you would use to make one cup of tea). Steep for 3 minutes. Strain mixture into mug, taking out the loose tea and spices. [yumprint-recipe id=’2′]Secret tip: orange juice. Seriously, it makes these carnitas to die for. Yes, you can make carnitas without it, but don’t. any other toppings you’d like! If you’re starting with a full pork shoulder, trim the skin and chop the meat and fat into large cubes. 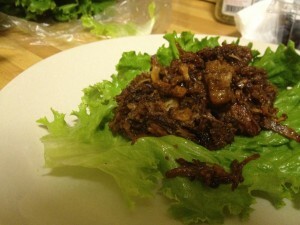 Put meat in a lettuce wrap and add whatever toppings you’d like! Fermented foods are a wonderful addition to any diet. They are teeming with healthy, beneficial bacteria (more commonly referred to as “probiotics”) that aid digestion and help regulate the immune system. Fermented foods are perfect for keeping our gut happy and healthy. Eating just a small amount of fermented vegetables daily will help you on your way to having a healthy gut. One of my favorite fermented foods is a Korean dish called kimchi. It is traditionally made from Napa cabbage, which is what this recipe will use, but you can substitute other vegetables such as bok choy, cucumbers, and many other vegetables – get creative! Kimchi is a great food to eat before a meal, or to throw into a stir fry (just don’t cook it otherwise you’ll harm those wonderful little bacteria – you’ll want to add the kimchi after the stir fry has cooled slightly). Chop cabbage into 1-inch squares (I actually end up chopping it more because I like it a little finer). Place in a large bowl. Add two tablespoon of whey to the mixture if you have it. I was a little bit lazy and just took the liquid off the top of some whole milk yogurt, so it’s still a little milky since I didn’t strain out the whey. Again, if you don’t have whey, just add extra salt (an extra tablespoon). This is the fun part! Now, take a kitchen tool – usually I use a wooden rolling pin with no handles – and beat the heck out of the mixture! You want the mixture to release its moisture, so it should get pretty watery. Add 1/8 – 1/4 cup red pepper powder. In this recipe I added 1/8 cup because I was feeling a like a little bit of a wuss today and I had a slightly small head of cabbage. Beat your mixture some more to mix in the powder. Finally, when your mixture is all mixed up, pack it in a jar. You want liquid to be covering the top of the mixture, so press the kimchi in the jar until the liquid comes to the top and covers the cabbage mixture. You’ll need to keep the jar at room temperature for about three days, at which point it should be delicious 🙂 You’ll want to refrigerate it after that in order to preserve it longer. 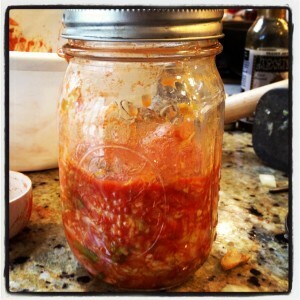 https://kelseykinney.com/wp-content/uploads/2012/04/Recipe-Kimchi.jpg 1306 1306 Kelsey Kinney MS, RD http://kelseykinney.com/wp-content/uploads/2016/10/website-.png Kelsey Kinney MS, RD2012-04-09 13:21:112016-11-19 12:47:55Recipe: Kimchi!